We take this opportunity to introduce ourselves as ‘Rainbow engineering solutions ‘– a unit of ‘Rainbow Super Polymers’.We have been in forefront of providing cost effective ‘Profiled sheets’. We undertake the entire process ranging from Designing to Productionof desired profile and finally installation of the sheets. We have covered more than tenmillion sq.ft of metal roofing and cladding for some of the best corporate houses andprestigious public sector undertakings. We provide cost effective solutions, which are sound, leak proof & give aesthetic look to the building. We provide the widest range of Roofing and wall Cladding sheets in dynamic profiles, colours and different cover-widths to remove all the hindrances that have come so far in materializing the dreams and imaginations of a client to come true. We provide separate profiles for roof and side walls with a range of matching accessories. 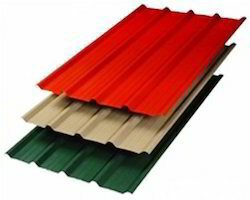 We bring forth to our clients Bare Galvalume Roofing sheets. 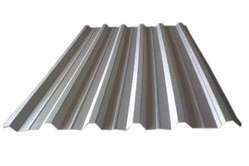 These sheets are very cost effective and are widely used in construction and building industry. metal made out of best-in-class and environment-friendly technology. During manufacture, products are treated with chemicals to enhance their paint adhesion and corrosion resistance. Epoxy / PU / Polyester / SMP / PVF2 resins are then applied by reverse coating technique and baked in a sophisticated computer-controlled oven. The result is a product which is highly resistant to corrosion, weathering and has excellent workability, durability and aesthetics. Products undergo stringent quality control tests to ensure performance in all-weather conditions. formidability and corrosion resistance are required. 8. Manufactured with a high precision pre painting process and adhering to stringent measures. The strength of stainless steel is destroyed due to atmospheric air and moisture. steel is basically stainless steel with a coating of Zinc metal on it. With raw materialsprocured from our reliable and trusted vendors, these roofing sheets provide consistency in strength along and across the sheets, are dimensionally stable and have low thermal conductivity. Owing to the multiple properties, these sheets can be availed at reasonable rates. Looking for Rainbow Roofing Solutions ?